I gave this three stars on my goodreads account. Given that this is a best seller, it may be that Harari's ideas have made their way into mainstream culture. I had a weird sense of deja vu throughout, as though I was reading a series of magazine articles I had already read before. - Harari says that scientific research leads to technological development, which I believe is the common wisdom. However, I recently read a paper for school that argued the reverse...that researchers are often "catching up" with the pragmatic engineers who tinker to create solutions that work, even without having a theory as to why they work. I don't know what is true, but it just struck me that Harari wasn't questioning some of this received wisdom that he was basing his arguments on. - In his chapter on capital, Harari write that many dinner conversations get bogged down in discussion of investment. Perhaps he was being ironic and I didn't get it? I felt that Harari's perspective on capital was very libertarian. - I really liked when he defined machines as an object that converts one form of energy to another. That gave me a lot to think about. - I was really struck by the repeated theme of human's subjugating animals. Vividly described. It renewed my interest in exploring veganism. I really enjoyed this book. Harari's ability to write clearly when describing the social nature of human created things like law and finance was amazing. The book clarified a number of things that had been bouncing around in my head for years. You probably already know this GMcG. 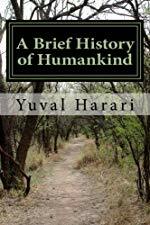 Harari became a vegan because of his research for this book. I didn't know that KaizenSoze! I was a vegan for a year in my late twenties and this book certainly rekindled my interest. I really strongly disliked this book a lot. It had been talked up so much, but most of the stuff in it, he just makes up, and it is not supported by research, at all. Hari never qualifies, and speaks with this blithe self confidence regarding things he couldn't possibly know - no one could - like why prehistoric humans did a certain thing. I would be very wary of taking any of the explanations he gives about humans creating law etc at face value. At best, he doesn't give a proper overview of the research and makes things seem more settled then they are. At worst, he basically just makes up what he thinks happened. He takes a few nuggets of interesting research and extrapolates them way beyond what they can bear. Real anthropologists and archaeologists would be shaking their heads at it. Real anthropologists and archaeologists would be shaking their heads at it. I know one of my Anthropology professors could rant about this guy at length. There are massive issues with his scholarship- if it can even be called that. That's interesting to hear that his book is not supported by research. Can you provide any links to that kind of criticism? What specifically is wrong..? I'm habitually wary of bestsellers but I did enjoy this book. Part of it is that it layed out more generically and in more detail what I was already thinking to some degree. A canny writer plays to the existing beliefs of his readers. Some of the more interesting parts to me are where the universal human rights are described as a belief. A very dangerous thought that. Or where the dynamics of globalism are described. Or communism and nazism. The best part of this book to me is its grand sweep. Reading it I thought: every politician on earth is going to use this as a basis for future strategy. Maybe he's less of a scientist and more of a strategic thinker. here is one by a anthropologist.